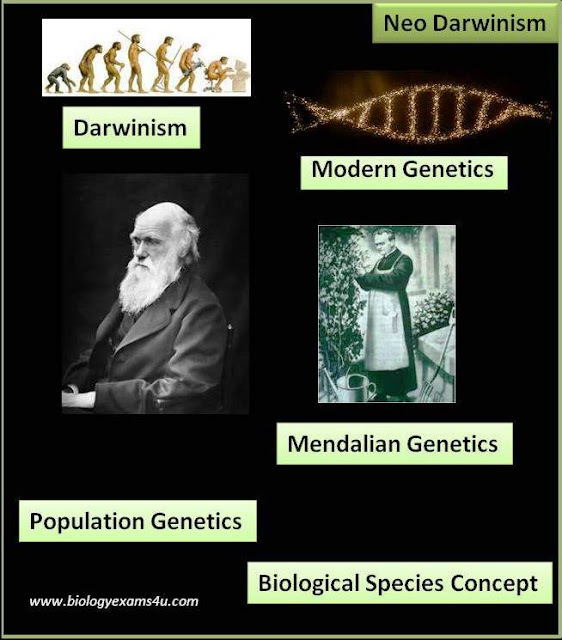 Also called as Modern Synthetic Theory of Evolution, Modern Synthesis or Neo Darwinian synthesis. Definition: It is the modified elaborated version of Darwinism with addition of data from Mendelian genetics, molecular biology, population genetics and biological species concept. According to Neo Darwinism, evolution occurs by natural selection of genetically modified characters or genotypes. August Weismann used the term Neo-Darwinism for the first time and he incorporated his theory of Germplasm into Darwin's theory of evolution by natural selection. 1. The unit of evolution is population not species. Each species comprises of many local populations. 3. Natural selection refers to the differential amplification of fittest genes and genotypes that is best suited to an environment and natural selection is not the only cause of evolution. 4. The formation of new species is by the accumulation of inherited random mutations and also by genetic recombination occurring due to independent assortment, fertilization and crossing over. 5. The major factors responsible for organic evolution include mutation, genetic recombination, natural selection and reproductive isolation.